I awoke this morning to find us in the calm anchorage of Paradise Bay. The water was glass, and bergs were slowly drifting by the boat, riding tidal currents. I set up a time lapse sequence on the stern of the boat and went below for breakfast. An hour later the sequence was finished, and it turned out to be pretty good when viewed in HD. The gentle swing of the boat on its anchor combined nicely with the slow movement of the berg and the passing clouds. Soon after breakfast we motored for about an hour to Neko Harbor, passing a smaller ship (with 250 passengers, crowded!) on our way into Neko Harbor. What a spectacular place. This was one of my favorite spots on the entire peninsula because we finally had a full day of encounters with mammals. (I had had my fill of penguins well before this morning). Light rain and some snow eventually cleared to broken sunshine lighting up the peaks that tower about the ice-filled bay. Two glaciers calved large bergs periodically, including a large snow avalance that blew apart into a cloud of snow late in the afternoon. On my morning zodiac outing, Al picked out some good ice for us to inspect, and Patrick took us in for a close look. 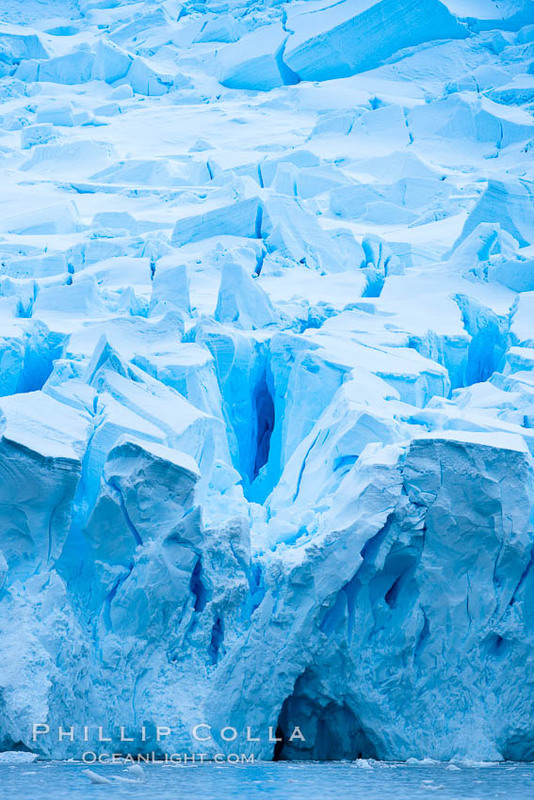 Huge columns of fractured blue ice defined the leading edge of a glacier. We took a lot of pictures of those formations, and also simply motored by them admiring them. Once back on the big boat for lunch I learned that another group was blessed with an inquisitive minke whale which stayed right next to their zodiac for 90 minutes, spyhopping and circling the 9 lucky viewers. One of the group mentioned to me, in a somewhat reverential tone, that it was a “life moment” for her. I recall some of my earliest, best encounters with whales at close range, and I understand what she must have felt. Good for them. 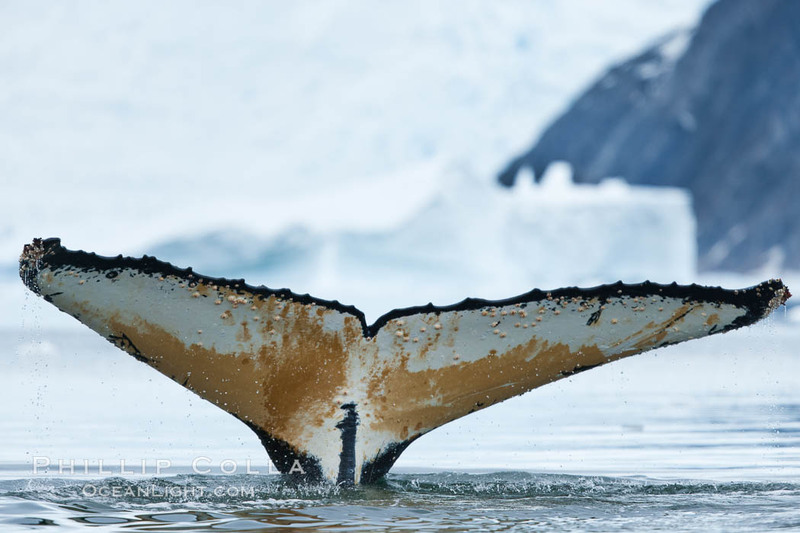 Throughout the day most of the us were fortunate to see scattered crabeater seals (Lobodon carcinophagus), Weddell seals (Leptonychotes weddellii) and leopard seals resting on bergs, along with an occasional minke whale and many good views of humpback whales. I managed to take a few nice photos of humpback whales (Megaptera novaeangliae) fluking up in front of ice, a shot which I had tried for years before in Alaska with no luck. At 4:30pm it was time to wrap it up and head out, too soon to leave Neko Harbor but we had to begin the long sail north through the Gerlach Strait and on to Hannah Point. 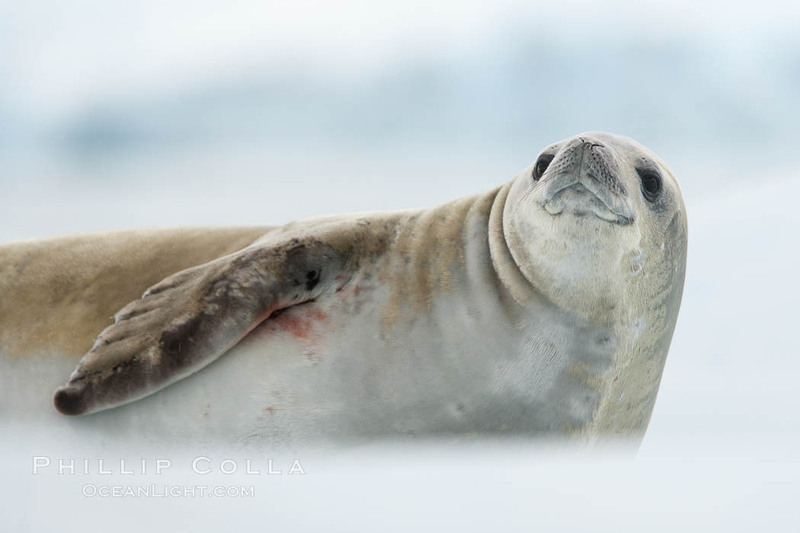 A crabeater seal, hauled out on pack ice to rest. Crabeater seals reach 2m and 200kg in size, with females being slightly larger than males. Crabeaters are the most abundant species of seal in the world, with as many as 75 million individuals. Despite its name, 80% the crabeater seal’s diet consists of Antarctic krill. They have specially adapted teeth to strain the small krill from the water.